As originally published in the June 2015 edition of the Valley Equestrian News. No part of this article shall be reproduced without written permission from the author. The job of any good personal coach is to ask the right questions, questions that will allow the subject to find the answers within themselves. The goal is to find authentic answers within that serve the highest good of the subject. Today, I have elected to take on the role of horsemanship coach. I would like to ask you some questions that may shift your awareness when working with your horses. In addition I will offer my perspective as food for thought. Perhaps you have already asked yourself these questions, perhaps you have not. The point here is to start a conversation dealing with a topic that I feel is sadly not given much consideration. As always my goal in life is to have horsemen and women thinking about WHY they do what they do with their horses. My basic motto is, do whatever you will in horsemanship as long as you make an informed decision and cause no pain, mental or physical distress. Please note I said distress not discomfort. To me they are two very different things. Distress denotes high emotion, stress and fear. Discomfort is part of life and part of physical and mental growth. Without a little discomfort many of us would not be physically fit or mentally healthy and the same holds true for horses. I believe however when we ask our horses to operate for short periods of time in discomfort we must be highly alert to the fine line. Personally when I ask my horses to do something a little uncomfortable, I try very hard to partner with them by continually asking “I know you don’t like this but can you do this little bit?” “How about that?” and so on. I ask lots of questions and am always looking for answers. I reward anything that looks like my horse is trying to do what I am asking. A reward can mean many things depending on the situation and the horse, typically however a reward for my horses means praise, a release or a softening mentally or physically. Remember, horses are strongly associative thinkers so rewards should be frequent and well timed. In addition, when we work in a little discomfort we must remember that we have to maintain a clear vision “this is what I want, this is what I want this is what I want” . The tricky part is maintaining a vision all the while remaining flexible and aware. What is compliance? Why is it necessary? When is it necessary? Where is my line with compliance? Lets face it, nothing we do to or with our horses is “natural” and in my opinion the term “natural horsemanship” could be considered laughable. Equine choices and options on a grand scale went out the window the moment we decided to put up fences. Our human role as I see it, is to provide clear, direct leadership as well as daily care and feeding because we have taken away the natural ability of the horse to care for and feed himself. This means we must be the “number one” and they the “number two”. Horses by and large are among the most sensitive and intelligent creatures I have ever encountered, however natural law dictates that the caretaker and provider must be the “number one” for a variety of reasons including the safety and well being of all. Much like being responsible for a child, there are times when we must have compliance from our horses no matter what. The basic question I ask myself is, does my horse have a voice? Compliance for me is necessary at time for horse medical issues, human safety issues and in some cases for training issues for short periods of time. I draw almost no line in emergency medical compliance, for training and compliance I draw the line at anything that causes mental or physical distress and or shuts my horse down mentally causing him to become “mechanized”. What is partnership? When can I be using it? How can I negotiate away from compliance demands in training and give my horse a voice? How can partnership benefit both of us? For me, partnership is about two things listening and asking questions. To make it more simple one thing – communication. Every sentient being on this planet has a unique story. If we want connection and partnership they key is truly listening to that story. Compliance issues come up in training. Lack of communication causes us as humans to move into mechanized compliance. One of my favorite examples is the position of the horse’s head while being ridden. Please allow me to be clear that I am well aware as a Classical Dressage rider that head position is not first and foremost in horse body mechanics under saddle but that is an educational topic for another day. So for the sake of discussion let us move forward, Student A cannot get her horse “round” or “collected” or any number of other terms we instructors like to fling out there. The point being that when Student A rides her horse his head is sky high, his back is hollow and he isn’t stepping under himself. This happens in every discipline across the board. The horse isn’t moving correctly when being ridden, lets tie his head down, up, sideways, put heavy shoes on etc etc. the list of human torture devices for horses is endless. So instead of training and partnering with the horse in a manner and shows him how to drop his head, lift the base of his neck, step under and lift his back and learning how to ride in lightness, lets simply tie his head down while he is being ridden. This is a classic training compliance demand. Our horse becomes mentally and physically mechanized and from a biomechanical perspective we actually perpetuate the issue we are trying to “fix”. So how could we navigate this issue from a partnership perspective? The answer is quite simple. Communication. There are certain universal truths with horses, things that really haven’t changed across the sands of time. As I work with horses I ask myself, “does my horse have a voice in this situation?” if the answer is no I ask myself “why?”. If ever the answer is “because I don’t know what else to do” or “its easier for me” I give the situation some serious re-evaluation. For me, the feeling of partnership with a horse is thrilling and addictive. The feeling of accomplishment when I can navigate interspecies communication barriers and convince a 1200lb being to willingly do what I am asking is indescribable. Reciprocating in kind for my horse partners is also pretty amazing, I have found that many of them have a sense of humor. Recently while riding my horse Zombado, we were working on a pirouette. For some reason pirouette work causes me to have occasional brain schisms. As I came down the center line and prepared for my pirouette, I had one of those moments. I believe if Zombado could have laughed at me and then sighed and said “its ok I will take care of this”, he would have. Though I was completely out of position and looking the wrong direction my partner took care of me and as I corrected myself he executed a lovely pirouette. He knew what I needed and what I wanted and he willingly did what I was asking mentally but not physically. That level of partnership is a gift that I treasure deeply. That is the sort of “golden nugget” that drives me in horsemanship. As you work and play with your horses I encourage you to ask yourselves many questions, look at things with new eyes and consider the questions above. As published in the January 2015 edition of the Valley Equestrian News – No part of this article may be reproduced without written permission from the author. In horsemanship we spend quite a bit of time and energy working on the mechanics of handling and riding horses. Where are my hands? What are my legs doing? Could I have timed the hand or leg aid better? On the other end of the spectrum are those of us who are not mentally present and/or not focused on what it is that we want from our partners. Basically we leave all decisions up to the horse and “react” to what they give us. The conversation between horse and human can get lost along the way as we “should” on ourselves “I should be doing this”, “I should have done that” or we simply don’t focus at all. Don’t get me wrong, proper aids and mechanics are very important as is riding for pleasure in a relaxed manner. As a riding instructor, trainer and lifelong student of horse manship and classical dressage I see (or have been in) many situations where horse handlers/riders know the aids but they are so focused on them that they end up “micromanaging” the situation. The best example I can think of is when we are learning to drive and we “overcorrect” the car and end up swerving down the road with timing that is “behind” the situation. We’ve all been there. The flip side is the rider who isn’t thinking about what they want. Instead they are either focused on what they do not want and or not focused at all. Perhaps you recognize yourself in one of the above scenarios. Maybe it is sometimes. Maybe it is always. Maybe sometimes it is one way and sometimes it is another. 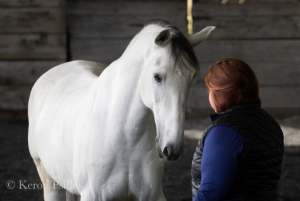 The good news is I have some insight on how to bring your partnership with your horse to the next level no matter what your discipline or riding style is. The truth is, no matter what our horsemanship style is, we all must provide leadership in our partnership with our horses. But, how do we accomplish this? The notion that leadership is entirely physical ie giving aids and physical movements on the ground and in the saddle has long since left my mental airport. Currently, before I do anything else, I picture what I want. I breathe and I focus and I give my horse the gift of being mentally present and give CLEAR direction via mental images. My own horses and the horses that I handle regularly have now come to expect this mental guidance from me. Each one of them reacts a little differently to my “mental envisioning”. However, one common denominator among them all, is that when I forget, or am tired or distracted even for a moment, when I come back to center and picture exactly what it is that I want, they all visibly relax and things begin to flow– akin to a human sigh of relief. Maybe I am. However, even if you can’t swallow that notion, how about the cold hard facts? The truth we all know about highly successful athletes is that envisioning a movement or and outcome can make the difference between winning and losing. To add to this scenario, I ask you to consider how often you feel “behind the curve” when handling or riding your horses? Think about it, are we “reacting” to what they give us? Are we trying to force things physically by giving repeated similar aids that aren’t working or only working in a mediocre way? It has been my observation that many of those handling and riding horses are not only not providing clear mental direction, they are not keeping a strong vision. There is no judgement behind that statement, it is merely an observation. I believe in those situations we best assist our partners by providing not only the clear mental direction as discussed previously but also a consistent vision . Instead of saying “no not that, no, no” what would happen if you responded with “this is what I want, this is what I want, this is what I want”? For me, this is best accomplished by visualizing and then holding that image. I want to clarify that statement by stating that doesn’t mean we aren’t flexible! We are always adjusting and readjusting our goals when working with our horses. In my experience it works best when I hold the vision calmly and patiently. If I am getting a lot of “questions” from my horse I may adjust my end result goal to end the session on a good note. The important part of that equation is holding your picture calmly and patiently. Not only are you clear in your own mind and heart about what it is that you desire, you provide consistent clarity for your partner. Staci Grattan and her husband Brion Fornshell Co-Own Spirit Horse Center in Brainerd, Minnesota. 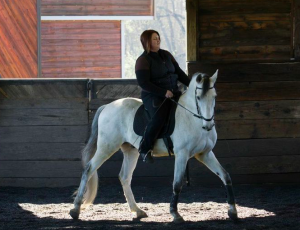 Staci enjoys using her focus on true classical dressage, basic and holistic horsemanship to assist horses and humans. Spirit Horse Center is located in North Central Minnesota and provides, boarding, training, lessons and regularly hosts clinics and events benefiting horse owners and horses. The word of the day is?